The Fire-fronted Bishop was formally described by Anton Reichenow, a German ornithologist and herpetologist. He was curator of the Humboldt Museum in Berlin and described many birds, as well as some frogs and lizards. The Fire-fronted Bishop was collected by Gustav A Fischer, a German African explorer. In 1876 he accompanied Clemens Denhardt's expedition to Zanzibar, where he settled as a physician. Fischer collected some birds in Zanzibar and then undertook a trip along the Kenyan coast where he collected some Fire-fronted Bishops. Identification. 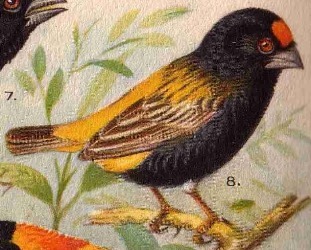 The Fire-fronted Bishop Euplectes diadematus is a small bird. The breeding male is black and yellow with an unmistakable orange-red patch on its forehead. The female and non-breeding male are the only small bishops with yellow-edged flight feathers (buff in other bishops). Queleas also have yellow-edged wing feathers, but the female Cardinal Quelea has a heavier bill, bolder markings on the upperparts, and a yellowish throat; the female and non-breeding male Red-headed Quelea is larger-billed, with dark moustachial marks and a yellow superciliary stripe. 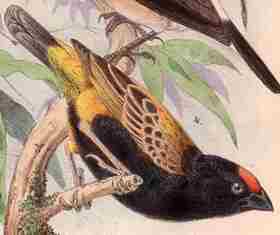 The Fire-fronted Bishop is much smaller than any other weavers with yellow-edged wing feathers. Distribution. The Fire-fronted Bishop occurs in Kenya, Somalia and north-eastern Tanzania (see map below, based on Birds of Africa). No races are recognised. Habitat. The Fire-fronted Bishop inhabits open grassland and cultivation, as well as bushed coastal dunes, rice fields and temporary swamps. It is nomadic, making large movements in response to rainfall. It does not form large flocks, but may associate with weavers and queleas in feeding flocks or at roosts. Food. The Fire-fronted Bishop feeds mostly on grass seeds such as those of Sporobolus and Echinochloa. While breeding, it also eats termites and spiders. It forages in small groups. Breeding. 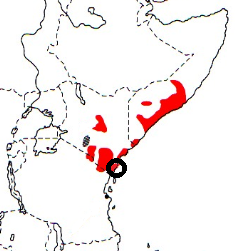 The Fire-fronted Bishop is probably polygynous. It is territorial, and breeds singly or in small colonies of 8-12 males. The male displays with head bowed, body plumage fluffed out, and he bobs up and down, rapidly flicking his wings. The nest is a round structure with a slight porch, and a large side entrance near the top. The nest is loosely woven of grass stems and grass blades, and lined with softer grass. Some nests are so loosely woven that the eggs can be seen through the side of the nest. The nest is attached to grass stems or twigs of small shrubs growing in grass clumps. The female may contribute to nest building, and continues to add lining during incubation. The eggs are pale blue, lightly speckled and spotted with black and grey-black markings.